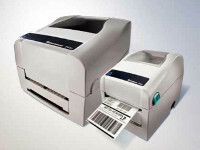 Intermec’s EasyCoder® PC41 printer facilitates label printing in almost any environment including retail, office, healthcare, logistics, government, manufacturing, and warehouse – particularly where space is limited. The PC41 is a small, compact desktop printer that prints labels, tickets, and tags up to 4.1 inches wide to meet compliance mandates. Connect and Print features of the EasyCoder PC41 printer ensure quick and easy setup and printing. The PC41 printer comes standard with software, drivers, cables, labels, and QuickStart Guide to facilitate getting started. 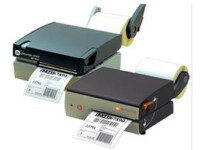 Businesses can integrate the PC41 bar code label printer with minimal training efforts. The unique double clam shell design minimizes down time with quick and easy media replenishment and QuickMount printhead changes. Labels and ribbons are easily swapped out via drop-in replacement. Additionally, Intermec offers a free printhead replacement program for customers who utilize Intermec printer supplies with the EasyCoder bar code label printer. Flexible communication options enable users to utilize open ports without interfering with equipment that may already be connected to the computer. The EasyCoder PC41 comes standard with RS-232 Serial and Centronics parallel interfaces. Optional interfaces include external EasyLAN Ethernet or IBM Twinax or Coax interfaces. 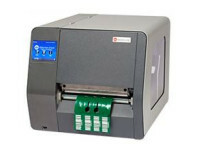 The battery option for the EasyCoder PC41 facilitates mobile printing. Labels are printed quickly and easily throughout a full shift, whether the printer is powered via AC outlet or battery. The EasyCoder PC41 printer is backwards compatible with existing EasyCoder 7421 printer installations. 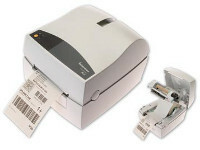 These small desktop label printers utilize Intermec’s unique programming language IPL. 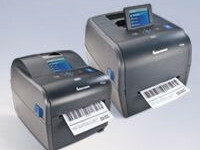 They are frequently used in conjunction with larger label printers such as the EasyCoder 3400e, 4420, and 4440 printers. Bar code label printing has never been so easy. The EasyCoder PC41 facilitates getting started with Connect & Print features, choice of stationary or mobile printing, and quick and easy media replenishment in a small compact printer designed to fit where space is limited.